The campaign to require Michigan health insurers to cover the cost of treating children with autism is getting an 11th-hour boost from the man who will assume the office of lieutenant governor Jan. 1 - state Rep. Brian Calley, R-Portland. Calley, whose 3-year-old daughter has been diagnosed with autism, is scheduled to meet with the Republican caucus in the state Senate when members return this week to the state Capitol. He is urging the Senate (where he will be the presiding officer beginning in January) to approve autism legislation adopted by the House in 2009. But Calley is not speaking for the administration of Gov.-elect Rick Snyder, who is not taking a position on the legislation, a Snyder spokesman said last week. And the legislation, opposed by a broad range of business and labor organizations, remains a long shot for final action in the lame-duck session scheduled to end Thursday. The Mackinac Center is urging a "no" vote. Twenty-three states have autism insurance legislation on their books, including neighboring Kentucky and Pennsylvania, according to Autism Speaks. Thirteen states and Washington, D.C., have or have endorsed autism insurance bills before their legislatures, including neighboring Maryland, Ohio and Virginia. Virginia's failed. West Virginia is among the nine states with bills awaiting introduction or endorsement. Five other states are not working on autism insurance reform, according to Autism Speaks, a nonprofit autism research and advocacy organization founded in 2005. The Philadelphia Daily News is carrying an article by Charles A. Williams III, an assistant clinical professor and director of the Center for the Prevention of School-Aged Violence at Drexel University. He writes of Aaron, a bright child with an autism diagnosis. In 2001, during the American Psychological Assn. 's annual convention, the Society of Clinical Child and Adolescent Psychology held a special panel discussion on ADHD. The experts lamented the fact that there appeared to be a tendency to "overdiagnose" and "overmedicate" children with ADHD. 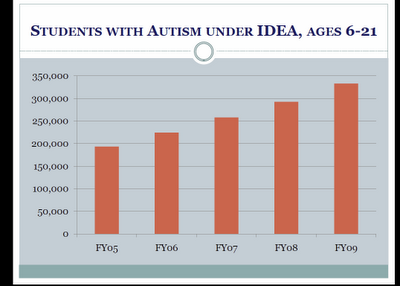 Now, fast-forward to 2010 as we consider the prevalence of the diagnosis of autism given to so many children. Is this a case of deja vu? Well, in a recent published interview, developmental neuropsychologist David Evans, of Bucknell University, stated that a parent may seek a label as way to get children the clinical and educational attention they need - and that this could lead to overdiagnosis. How sad. Such a statement suggests that without a label, many children wouldn't get the quality support, resources and education they deserve. And even when we do correctly diagnose, with the state of American education being what it is, can we hold out hope that Aaron may one day follow in the footsteps of a Temple Grandin, the renowned animal scientist with autism, featured in the recent award-winning HBO movie? I don't pretend to have the answers to all these questions, but what I do know is that without them, the fate of many of our nation's most vulnerable children will continue to hang in limbo. As the Fort Worth Star-Telegram reports, prosecutor Leticia Martinez and her husband Jeffrey Cureton have run into a loophole in the Texas mandate. Undeterred, Martinez appealed, pointing out that autism is classified as a serious mental illness, that ABA is medically necessary and that Texas law says it has to be covered. But the third-party administrators, HealthSmart and Managed Health Network, denied her appeal, saying self-funded plans are not subject to state law and ABA is considered "educational," which is excluded from her plan. In February, Martinez appealed to PEBC [Public Employee Benefits Cooperative] Executive Director Diana Kongevick, who sent Martinez a letter four months later upholding the denial. "No medical plan covers everything," Kongevick said in a recent phone interview. "That doesn't mean one thing is more important than another. But we couldn't afford in this country to have everything covered, period. It is just not going to happen." Meanwhile, in the midst of the appeals, Cureton was appointed a federal magistrate judge for the Northern District of Texas -- a position that also offered a self-funded insurance plan but no coverage for ABA. "I was surprised when I got this appointment that ABA was not covered under any of the federal health benefit plans," he said. Deeia Beck, executive director of the Office of Public Insurance Counsel, a state advocate for insurance consumers, is among those who believe that self-funded insurance plans should also cover the therapy. "People often believe state plans have better coverage than private plans and this is an example where, clearly, this is not the case," she said. "ABA therapy has been shown to be extremely effective and that is why it's mandated. It distresses me that other plans do not include that mandate." For many families, the cost is offset by a program offered by the Texas Department of Assistive and Rehabilitative Services, which contracts with six autism centers statewide, subsidizing the cost of ABA for autistic children ages 3 to 8. But the waiting list is long. And many insurance companies don't cover ABA. The state mandates fully funded insurance agencies to cover it, but self-funded insurance plans aren't subject to state law and often don't cover it on the grounds that it is "experimental" or "educational." "I disagree with that," said Dr. Joyce Elizabeth Mauk, CEO of the Child Study Center. "Even the state Legislature has identified it as a medical treatment. It's probably the most studied and most scientifically validated form of treatment for autism." In Ethan's case, ABA has worked wonders. He no longer just points at what he wants and says "Ma" but now uses words to communicate. And for parents of autistic children, Le said, those kinds of milestones are priceless. Doctors have always provided treatments that did not have a track record in randomized, controlled trials. Often they've provided such treatments without any serious intent of obtaining scientific validation. Rather, they were usually convinced that the treatments would work, or at least that their errors would eventually lead them to discover a real therapy. It has also been the case that these doctors have been treated with disdain, even persecuted by the medical establishment. Many of them retreated to the shadows, continuing to practice their brand of medicine but with a low profile. Others proudly soldiered on in what they believed to be a noble, though lonely, cause. Like the DAN doctors have with autism, physicians have attempted alternative treatments for Lyme Disease and various degenerative conditions. Shannon Mullen's excellent series on special education in New Jersey is here. Parker’s complaint is that after stints at four public schools in four different districts, Jacob’s problems seem to be getting worse. In each case, she said, her son was placed in a fledgling autism program staffed by inexperienced teachers and aides who weren’t required to have any special training in autism. The teachers and schools were under no obligation to show any measurable results for her son. The lone bright spot, she said, were the five years Jacob spent at the Children’s Center of Monmouth County, a state-approved private school that specializes in autism. The staff there was “working miracles” with Jacob, Parker said. His outbursts diminished, and the family’s home life improved. Then, more than a year ago, the Pinelands Regional School District pulled Jacob out of the school over his parents’ objections, after the New Jersey Department of Education enacted new “fiscal accountability” rules. Those rules were aimed at getting districts to curtail costly placements to private special-education schools. But transferring Jacob doesn’t appear to be a cost-saver. In fact, his tuition costs, paid for by the Pinelands district, have increased by 50 percent. While the Children’s Center charges $56,000 per student, Jacob’s new school, Southern Regional High School in Stafford, charges $85,000. It is frustrating for Parker to see Jacob in yet another unproven autism program. The district’s superintendent, Craig Henry, wouldn’t address Parker’s case, citing student confidentiality rules. But Henry noted that the Individuals with Disabilities Education Act, the chief federal law regulating the nation’s special-education system, doesn’t require districts to collect that kind of aggregate data. The only available gauge is parental feedback, which Henry said has been overwhelmingly positive since the district started an autism program in an unused wing of the junior high school three years ago. As Matthew Normand writes, however: "Despite their best intentions, parent reports are poor sources of evidence, as parents rarely have extensive training in behavioral observation, their observations are not independently corroborated to ensure accuracy, and, being the parents of the children observed, they are far from objective." Autism legislation passed by Democrats in the state House but once dead in the water in the Republican-controlled Senate will get a second look Tuesday after pressure from Michigan's lieutenant governor-elect, Rep. Brian Calley of Portland, whose daughter is diagnosed with the complex neurobiological disorder. The House legislation would require insurance companies to cover autism therapies, which can cost as much as $50,000 annually. According to the Autism Society, 23 states have adopted similar reforms. Calley released an emotional YouTube video this week [see November 23 post] in which he vows he "will no longer remain silent" on the need for autism insurance reform, which he says can save the state money. Matt Marsden , spokesman for Senate Majority Leader Mike Bishop , said the issue will get a hearing — at which Calley will speak — before the Senate Republican Caucus next week. Sen. Randy Richardville , the majority leader-elect who co-chaired hearings on autism last summer, said the House-passed legislation is unacceptable because it mandates insurance coverage. He wants to look at alternatives, such as riders on insurance policies, and would impose dollar limits on the cost of care. The Pediatric Nurse Practitioner blog lists the top 50 blogs about autism. In New Jersey, one in every 94 children has an autism spectrum disorder, the highest incidence rate among the 16 states surveyed by the federal government. DIFFERENT TEACHING METHODS: That means that students often have to be taught in a completely different way than other children. Yet as many parents soon discover, the way that happens in New Jersey — which has no uniform curriculum standards for autism programs or any special training requirements for teachers who work with autistic students — can be as confounding as autism itself. "There is no uniformity across the state. It's a problem we constantly run into," said Gary Weitzen, executive director of POAC Autism Services, a parent-run, grass-roots autism education group based in Brick. "Districts very often right next door are doing radically different things." But there are no state standards for what an ABA program ought to consist of, so districts can tell parents they have an "ABA-based" program or boast that their teachers are "ABA-trained" without having to meet any minimum requirements. Even when teachers are well versed in the principles of ABA or another autism methodology, their supervisors rarely are, at least not in the public school system. Autism experts say a credible ABA-based program should be overseen by a board-certified behavior analyst, a certification that requires extensivecourse work and closely supervised field experience. But neither the job title of behavior analyst nor the certification process to become one are recognized by the state Education Department, so few districts have such an expert on staff. One encouraging sign, Weitzen said, is that in the past 11 years, thousands of teachers from hundreds of school districts across the state voluntarily have attended POAC's workshops. While a good start, he noted, a half-day workshop is not sufficient to ensure that autism programs are being run effectively. "We stress that you need consistency, you need follow-up, you need BCBAs (Board Certified Behavior Analysts) in the school," Weitzen said. Growing along with those numbers is one of the most aggressive, lucrative, bewildering and often just plain useless sales forces humanity has ever seen - call it the ADHD-industrial complex. This includes not only the U.S. pharmaceutical industry, which by one measure sells more than $5 billion worth of ADHD medications each year - and which only in the United States and New Zealand may market directly to the public - but a growing league of all-but-unregulated, usually costly and sometimes wildly imaginative alternatives, including herbal supplements, complicated exercise regimes to stimulate specific brain regions, magnetic mattresses, personal coaches and therapy "assisted" by dolphins. If modern mothering is madness, what metaphor might suit the straw-grasping of parents of children with this disorder, whose main symptoms are distraction, inattentiveness, forgetfulness and impulsivity? The ADHD industry's exuberance matches the vulnerability of its target market: millions of desperate parents who, given the strongly hereditary nature of ADHD, are often just as distracted and impulsive as their progeny. The mother herself got a diagnosis of ADHD at age 50. Similarly, some parents of kids on the spectrum learn (or at least suspect) that they have HFA or AS. While the state weighed billions of dollars in social services cuts to bridge a gaping budget deficit, tax records show one state-funded nonprofit group paid its president a salary of $520,000 to oversee the housing and care of several dozen people with developmental disabilities. Jack Hinchman, president of the Ontario-based nonprofit Benson House, also received $281,800 that year to lease his own properties to the organization, according to the group's 2008 tax return, the most recent available. The nonprofit's board of directors, charged with monitoring Benson House's practices, included Hinchman's mother and another relative. Advocates for disabled people and two state legislators said the practices at Benson House aren't isolated cases in California's system of 21 nonprofit regional centers, which distribute billions of dollars in state money each year to groups aiding developmentally disabled people. Regional centers award often lucrative contracts to service providers without competitive bids, which would shed light on proposed spending and help tamp down costs. State laws don't require regional centers to reveal to the public the rates they pay specific service providers. The state doesn't even require the centers to produce lists of the providers they use, said Boyd Bradshaw, director of a coalition representing 1,200 state service providers. Trying to evaluate the effectiveness of the special-education programs offered in individual public school districts, in private schools and in regional and county specialized schools is virtually impossible without access to better data about costs and longitudinal studies that allow districts to track progress of individual students and categories of students. You can't fix something you don't understand, as one special-education advocate put it. Sadly, there is no good cost data and no good data on outcomes. It has been a decade since the state took an in-depth look at special education. It's time for another study — one that will enable educators, parents and public officials to better determine which approaches work best and in what settings, and which programs are most cost-effective. 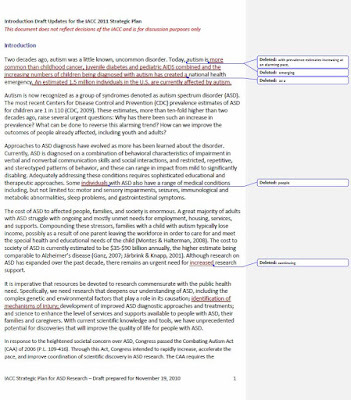 Thanks to the "track changes" function, we can see some significant edits to the draft introduction to the IACC Strategic Plan Update. Two decades ago, autism was a little known, uncommon disorder. Today, with prevalence estimates increasing at an alarming pace, autism is emerging as a national health emergency. Autism is now recognized as a group of syndromes denoted as autism spectrum disorder (ASD). Two decades ago, autism was a little known, uncommon disorder. Today, autism is more common than childhood cancer, juvenile diabetes and pediatric AIDS combined and the increasing numbers of children being diagnosed with autism has created a national health emergency. An estimated 1.5 million individuals in the U.S. are currently affected by autism. Thirty-five years ago, the passage of Public Law 94-142 was a model of bipartisan co-operation as Democrats and Republicans worked together to do what was right for America's children. The law was a major civil rights victory. We must never lose sight of the history here. In 1975, more than one million children with disabilities were being turned away from school altogether. Hundreds of thousands of children with severe disabilities were in institutions that didn't meet their needs. Those students with disabilities who did attend public schools often were bused long distances to schools where they had little chance to interact with the full range of their peers. Those who went to a neighborhood school were usually placed in separate classrooms – not infrequently in a room as unwelcoming as a converted broom closet. Even worse, many students with learning disabilities were never identified for the services they needed. Instead, they were labeled as lazy or unfocused and never received the supports that would enable them to reach their true potential. Through IDEA, Democrats and Republicans agreed on several important principles. Students with disabilities should be guaranteed a "free, appropriate public education." They should learn side by side with peers of all abilities. They should have an individualized education program to guide their educational experience. And, parents should work with school officials as partners in their children's education. These are the foundational principles that have transformed education for students with disabilities. Intermediate school districts in this state are now charged with providing accommodations for pupils with special needs including autism. A federal mental health parity bill adopted several years ago also requires treatment coverage for autism. The Obamacare health bill adopted by Congress will also affect autism coverage. So why would the state Senate want to lock a coverage mandate — which involves specific treatments — into state law now? Autism is a complex condition and medicine's understanding of it is rapidly changing. A state coverage mandate introduces unknowns into the state insurance market, which is itself in flux because of changing federal law. The House version was opposed by most business groups. But it was also opposed by the Michigan AFL-CIO and the UAW on the grounds that they want to be able to bargain their health care coverage options. It simply isn't good policy to adopt this legislation now and the Senate shouldn't go forward with it. Some parents of children with autism say New York is making a huge mistake. CBS 2’s Tony Aiello reports the state Board of Regents on Tuesday voted down a long-time rule that mandated speech and language services for autistic kids. Aiello went to a school in Suffolk County on Tuesday and learned that five days a week youngsters Tyler and Sammy receive speech therapy as part of a program for students with autism. The daily schedule was mandated by the state — until now. “My fear is that without these reasonable mandates in place, most districts will walk away from the table and tell parents ‘we don’t do speech here,’” said Louis Conte of the Autism Action Network. Conte has two sons with autism and he’s upset over the Board of Regents’ decision to end mandated speech therapy in New York. For more than 20 years the Regents said kids with autism had to receive five-day-a-week therapy and students who qualified for so-called “related services” had to get two days a week of speech and language. There are no proposed amendments that would require a reduction in services to students with disabilities and lower NYS' standards for students with disabilities. The proposals to repeal the minimum service delivery requirements for speech and language as a related service and the minimum daily frequency and duration for instructional services to address the individual language needs of students with autism and to add a waiver for the number of students with disabilities in an integrated co-teaching class are to ensure that Committees on Special Education (CSEs) have the appropriate flexibility to make recommendations for each student with a disability based on individual needs. These proposals do not relieve the local school districts of their obligation to ensure that all students with disabilities are identified, located, and evaluated and are provided a FAPE to address his or her needs. The biggest growth in special-needs students in the Santa Clarita Valley and statewide has been among those diagnosed with autism. 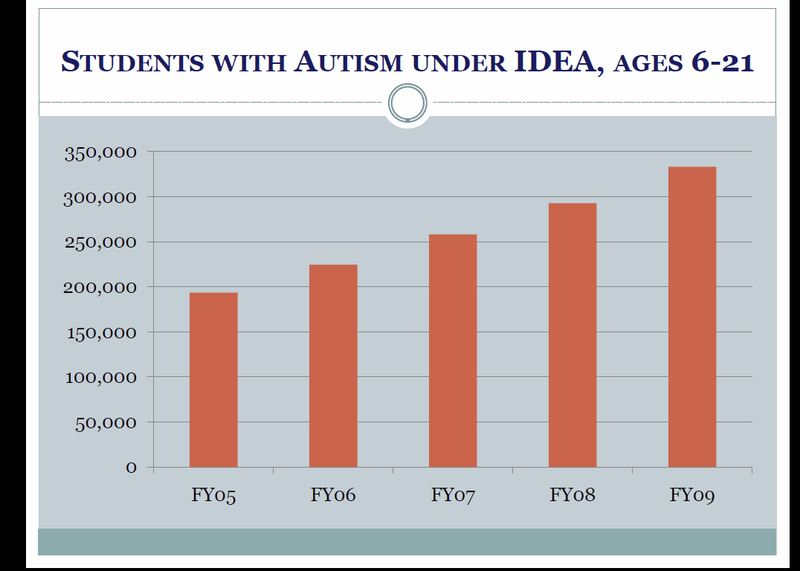 In December 2009, the valley had 758 students with autism, a big jump from the 214 students with autism in 2002, according to figures from the Santa Clarita Valley Special Education Local Plan Area. Many factors contribute to the growth in special-needs students, said Margaret Cherene, director of the SCV Special Education Local Plan Area, which manages the five local school districts’ special-education programs. “The medical profession is doing more and more to save babies who would not have survived 30 years ago,” Cherene said. In addition, parents are generally more aware and involved in their students’ learning than were parents decades ago, she said. “When they see a child who is struggling in school, they want to find out why,” Cherene said. But the rapid growth in the number of Santa Clarita Valley students with special needs may be attributable to another factor, as well. Santa Clarita Valley schools’ strong reputation for academic excellence means that families with special-needs students may be moving here specifically to enroll their students in local schools. “Parents do move here because we have a wonderful reputation,” Cherene said, adding that the closeness of high-profile research institutes like UCLA makes the valley especially attractive. “They just want their child to be the best child that they could be,” said Joyce Johnston, director of student-support services for the Saugus Union School District. Earlier posts have dealt with service dogs. The issue is ongoing. Seven-year-old Kaitlyn Gennaro remained calm during a recent trip to urgent care, when her family thought she hurt her ankle. Typically, her mother Catherine said, she'd be upset, crying or running around. But this time, she was fine and even went for an x-ray by herself. Her mother said it was because Kaitlyn, who is autistic, knew that Phillip, her new black Labrador from Susquehanna Service Dogs, would be waiting for her afterward. "I don't know how we lived without him," Catherine Gennaro said. The family thought Phillip could help Kaitlyn at school, too. But Phillip has not been allowed to attend school with Kaitlyn at Shrewsbury Elementary. Her parents believe the Southern York County School District has violated her rights by not allowing her to bring a service dog. The district doesn't view Phillip as a service dog and says Kaitlyn's needs are being met without him. The family of an Estates Elementary School kindergarten student is fighting the Collier County School District over whether the autistic boy’s service dog can come to school. The Collier County School District defines a service animal as “an animal trained to accompany its owner or handler for the purpose of carrying items, retrieving objects, pulling a wheelchair, alerting the owner or handler to medical conditions, or other such activities of service or support necessary to mitigate a disability." Scooter Givens had a meltdown on a school bus in September, but nobody told his mom. That's how it's been since Disability Rights Oregon filed a civil rights complaint with the U.S. Department of Justice to allow the 10-year-old, who has autism, to have his trained service dog at Patterson Elementary School. For the past two years, Hillsboro School District has forbidden the dog, saying Scooter's behavior can be controlled without the German shepherd. Scooter's mom, Wendy Givens, says the dog, named Madison, improves her son's access to his education by keeping him calm. It's been a year since Disability Rights Oregon filed the complaint on behalf of the Givens. The delay is at the federal level. The U.S. Department of Justice investigation appeared to hit a peak this summer but has since gone quiet. Canby is one of few districts in Oregon that allows an autism service dog in its schools. Beaverton is expecting to allow one this year, but Hillsboro has denied the use of an autism service dog for a 10-year-old boy at one of its elementary schools. The family filed a civil rights complaint a year ago. Canby lacked an adequate policy to deal with service dogs and created their own, said Jeff Rose, Canby School District Superintendent. Results from a Phoenix study of a behavior therapy designed to cure autism give hope to thousands of Arizona families and could revamp special education in the state's public schools. But the costly price tag could keep the treatment out of reach for many families. And the state's budget crisis could mean implementation is years away at the school level. The Center for Autism and Related Disorders says it has cured six of 14 autistic children who participated in a $5.4 million, state-funded study in the Phoenix area. CARD, a nationwide private treatment and research organization with a program in Phoenix, received the state money for a three-year study to determine whether its intensive behavior therapy could cure young children who had been diagnosed with autism. Doreen Granpeesheh, CARD founder and executive director, announced the results at a news conference Thursday in Paradise Valley. "We were able to achieve normal functioning for 43 percent of our children - 43 percent are recovered," she said. It is unfortunate that the story speaks of a "cure" -- a term that does not appear in the CARD news release, which instead speaks of recovery. The distinction is crucial. Cure suggests that the underlying condition is gone. But there is as yet no cure for autism, and CARD is not claiming one. Recovery is about achieving a normal level of function in spite of the underlying condition. In other words, it's a "work-around." In this case, the work-around proved highly effective, but until someone develops a medical intervention, the brains of people with autism will differ from the brains of typically developing people. Also note that recovery is not a new concept. See the work of the late Ivar Lovaas, particularly his 1987 study. One key part of the progressive agenda of the last century has been improving health – and especially children’s health – through mass vaccination against deadly diseases. And now come a new group of people, autism parents, who allegedly want to roll back all this progress so long in the making. And how do they want to accomplish this nefarious (and nebulous) goal? By questioning the consensus that genes cause autism, and by claiming that the environment – and plausibly some aspect of the very same mass vaccination campaign -- is implicated in autism’s epidemic rise. Cleverly labeling these concerns “anti-vaccine” and, implicitly, anti-progress, makes it easy to ignore a fundamental truth -- that every ideology including progressivism can go too far, get hijacked by forces that should be its natural enemies, and fail to understand what is required at a particular historical moment. Darrell Steinberg, president pro tem of the California State Senate, writes about Governor Schwarzenegger's cuts for mental health services (AB 3632) for special education students. - "Robbing Peter to Pay Paul:" The Governor's actions in eliminating AB 3632 services will impose an additional fiscal burden on the general educational system; therefore, all students (not just the kids with autism) are being hurt by these cuts. - Early intervention services enable about 1/3 of autistic students to attend regular classrooms with estimated cost savings of $10,000 to $20,000 per student. California is in the midst of an autism epidemic with over a 12 fold increase in this condition during the past two decades. Providing effective treatment for autism is a wise investment in our educational system. - The U.S. Surgeon General has reported that one in every five children has some form of a "mental disorder." If untreated, many of these children will subsequently develop drug addiction, homelessness, incarceration (22% of prisoners have mental illness), and other costly, tragic outcomes that impose severe consequences on all of our communities and out State's general fund. - Serious mental illness is associated with a national annual loss of earnings totaling $193.2 billion. Early diagnosis and treatment are essential to overcoming these disorders. Our society and our economic future will be better served by individuals who are "taxpayers rather than tax-takers." - Governor's cuts are unconstitutional. Since the AB 3632 programs are considered as "mandates" (required services), they can only be reversed by the state Legislature. Mental health and disability rights advocates have filed a class-action lawsuit against the Governor. Regretfully, in the meantime, many school districts and students will suffer with uncertainty and chaos from these draconian cuts. I hope that these comments are helpful in clarifying my position on the importance of restoring these services to our students and schools. Furthermore, I am very interesting in hearing from you directly. Let me know what you think by visiting my website (click here) or emailing my staff (Lou Vismara at louis.vismara@sen.ca.gov .) Working together we can make a difference to improve the lives and outcomes for all of our students. Misapprehension of statistics and scientific process has been even more apparent in the misunderstandings surrounding vaccines and the onset of autism. Given the age at which children receive immunizations and that at which many cases of regressional autism manifest themselves (in which a seemingly normally developing child suddenly loses much of the ability to communicate as well as other acquired functions), "by chance alone" there will be a lot of children who regress at some point after getting their scheduled vaccines, Daniel Salmon, a vaccine safety specialist at the U.S. Department of Health and Human Services (HHS), said here on Tuesday. As he pointed out, however, "temporality is insufficient to show causality." But underlying—and perhaps highlighted by—this "logical fallacy," he explained, is a frequent hang-up of science communication: the devil is in the details, and the details can be complicated (and not too catchy) to explain. When former Jenny McCarthy, an advocate of the vaccine-autism link, goes on CNN's Larry King Live and says, "'Vaccines cause autism,' that's a very clear, simple message," Salmon noted. Most respected scientific bodies, however, are not prone to such blanket statements. 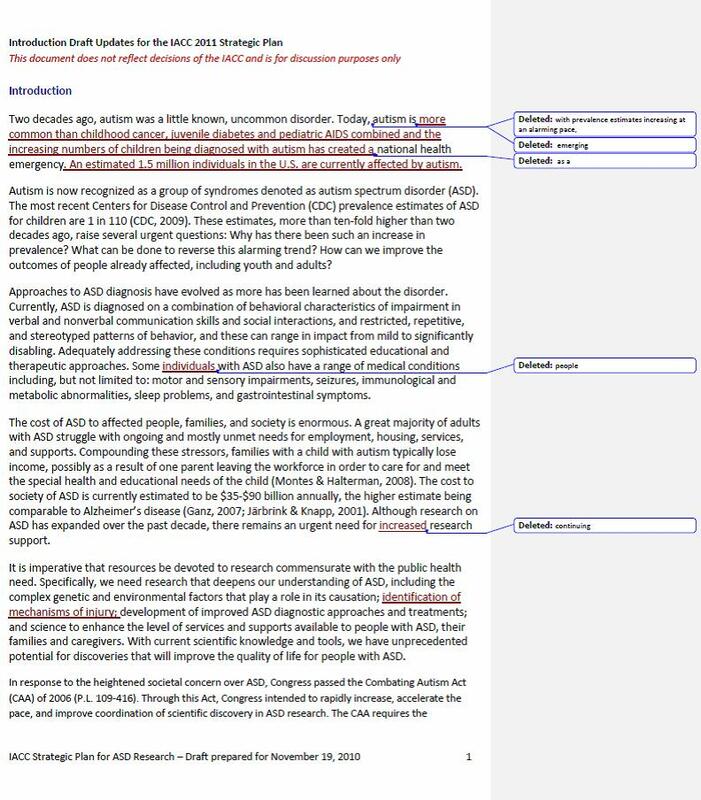 In a 2004 report essentially dismissing the assertion that vaccines cause autism, the Institute of Medicine (IOM) was notably more measured than McCarthy, concluding that "based on this body of evidence, the committee concludes that the evidence favors a rejection of a causal relationship between thimerosal-containing vaccines and autism…" The report also included appropriate caveats about the limitations of the available data, which many in the anti-vaccine community took as evidence that there was in fact evidence for a link. Much of the rallying around vaccines (and/or their thimerosal additive) and autism has centered on powerful stories about children who developed regressional autism shortly after receiving immunization. But "the anecdote is not data—though it often seems that way" in the public debate about autism's causes, Salmon said. And likewise, correlations are not the same as causation. All kinds of outside factors, from recommended vaccines to the size of the internet, can be plotted to match the rising curve of autism rates, he noted, underscoring that "I'm not suggesting that the internet causes autism." Despite the dearth of durable data showing that vaccines can induce autism, some 25 percent of parents in the U.S. still believe them to be a possible cause (a statistic which is "really quite remarkable," Salmon said with a bit of distress). And the cautious nature of science is unlikely to be able to dispel belief in the link any time soon. "It's exceedingly difficult—and some in epidemiology would say impossible—to prove a negative," Salmon said. The [IEP] exception gives the techniques "a false sense of legitimacy," said Denise Marshall, the executive director of the Council of Parent Attorneys and Advocates in Towson, Md. The Council For Exceptional Children, a professional organization of teachers, administrators, and parents in Arlington, Va., also opposes the bill. But an organization that played a key role in bringing attention to injuries and deaths caused by restraint and seclusion has come out in favor of the bill, saying that it is imperfect but better than no national prohibition at all. "We made a political calculation after surveying our states," said Curtis L. Decker, the executive director of the National Disability Rights Network in Washington. The organization's report last year on abusive restraints and seclusion was the genesis of the most recent federal efforts to address the practice. "If this bill dies, I doubt we're going to see any movement on this for years to come," Mr. Decker said. The strongly held differences in opinion, plus the change in the political make-up of Congress following this month's elections, makes the future uncertain for a federal ban. Even if the measure were to pass in the Senate unchanged, it would still have to be reconciled with a more-restrictive House bill on restraints and seclusion that passed in March. The House bill bans restraints and seclusion from being considered as an intervention in a student's IEP. An earlier version of the Senate bill also had such a ban. But that bill was withdrawn and a new bill submitted in September, when Mr. Burr was added as a co-sponsor. Russ Kinkade holds up a pen. If it were broken, he says, he would toss it. "So if you objectify people and see they are broken, then it makes logical sense that you would discard them," concludes Kinkade, executive vice president of Shepherds Ministries. Located south of Milwaukee, the nonprofit Christian organization has 53 years of experience in overcoming the perception that people with disabilities have little to contribute to society and thus can be discarded. In 2008, the ministry launched Shepherds College, the nation's first faith-based residential college exclusively for students with intellectual disabilities. At the end of the current academic year, Shepherds, a three-year program, will graduate its first class. Intellectual disabilities include autism, Down syndrome, brain injury, or other developmental complications. Students at Shepherds have mild to moderate disabilities and are typically at a third-grade or higher academic level. In the U.S., about seven million people have an intellectual disability, affecting about one in ten families. Debra Hart, educational coordinator at the Institute for Community Inclusion, a Boston-based nonprofit, says for the past 35 years, students with disabilities have grown up as members of their communities. Like their peers, they dream of going to college, getting a job, and living on their own. But, as Hart wrote in a 2006 report, "Of all students with disabilities, those with intellectual disabilities have the poorest post-school outcomes." Shepherds employs 12 teachers and 8 staff, some of whom were trained by Gary Meers, who teaches career planning for people with disabilities at the University of Nebraska-Lincoln's Department of Special Education. Although studies have yet to determine which type of program is most effective, Meers likes the amount of independence Shepherds College provides, in that "students identify for themselves what works." Congress recently approved $11 million toward a grant for postsecondary education programs for intellectually disabled students. Unemployment is high among adults with disabilities. In 2009, 19 percent of all adults with any kind of disability earned a paycheck, compared with 64.5 percent of Americans without a disability. Various national studies show that graduates of postsecondary education programs have higher employment rates and earn higher incomes, Hart says. There are important ethical, legal and social issues implications resulting from the study by Miller et al., particularly relating to screening for genetic and other markers for autism and other developmental disorders. There is a diverse range of opinions in the autism community on early screening for autism ranging from strong support for developing biologic prenatal screening methods to concerns that such efforts may lead to selected terminations of fetuses showing genetic or other biomarkers of increased risk. It is imperative that autism research proceed with the appropriate precautions and safeguards and that the concerns of the autism community are reflected in this process. At this point, the state of the science is focused on improving early screening in the first years of life to identify risk for an ASD in order to initiate early intervention to reduce or prevent the development of disabling symptoms and promote positive skill development. The study by King et al. highlights the need for a clearer understanding of the challenges and barriers to screening and referral. Studies are needed to determine the factors that lead to implementing screening and referral programs that successfully serve children with ASD and their families. Studies should include factors relating to the clinical practice, availability and collaboration among community-based services, and information needs of parents, other caregivers, and early educators. There is a lack of reliable and valid screening and diagnostic tests for use in international, resource-poor settings. Early screening and diagnosis when coupled with inexpensive, parent-guided interventions is an important potential prevention strategy in such settings. Research is needed to identify effective methods for screening especially children at higher risk for ASDs, such as the extremely preterm children studied by Johnson et al. During the 1990s, the typical age of diagnosis for autism fell, from almost 6 years to 3 years of age. Although early diagnosis is widely viewed as essential to the most effective interventions and treatments, there is substantial variation in who is diagnosed early or later. In this paper, we explore the characteristics of children, families, and communities that are associated with diagnostic timing, and how these have changed between the 1992 and 2001 birth cohorts. We find that the most robust determinant of early diagnosis is parental education, and that although the gap between high and low SES children has diminished over the decade, it remains significant. In 1994, Californians passed Proposition 187, a ballot initiative aimed at keeping undocumented immigrants and their children from using publicly funded social services. We link the passage and overturning of Prop. 187 to observed patterns of enrollment of the children of Latina immigrants in the Department of Developmental Services (DDS) autism caseload over time. Although the group of children we examine were US citizens, born in California and fully eligible for DDS services, many of them live in households of mixed immigration status, and we find evidence of a 'chilling effect' on their service utilization. Specifically, after Prop. 187 is passed enrollment is depressed, relative to native-born whites, then increases rapidly after it is overturned in court, only to decline again with heightened post-9/11 immigration enforcement. This suggests that some citizen children with autism living in mixed-status families do not receive, or receive late, the developmental services to which they are entitled. These findings remind us that autism rates are in part a product of the social and political environment, and that immigration policy can have unintended consequences for our most vulnerable citizens. 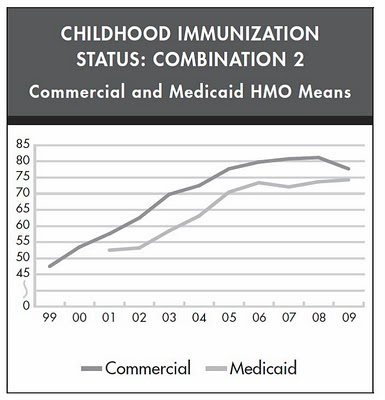 Childhood vaccination rates in 2009 declined by almost four percentage points in commercial plans. A possible cause of this drop is commercial plan parents may refuse vaccines for their children based on the unproven, but increasingly popular, notion that vaccines cause autism. Celebrity activists are outspoken advocates of this view. 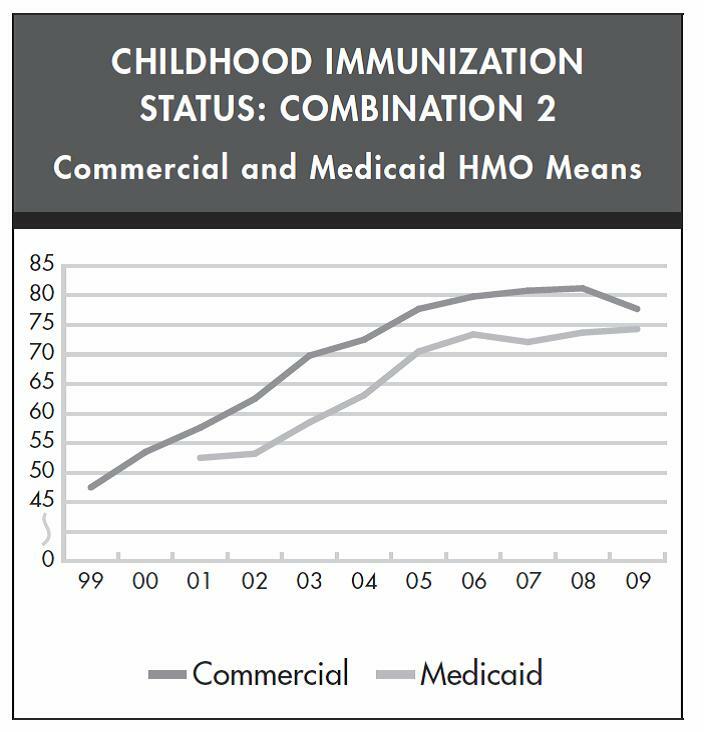 Interestingly, we see vaccination rates in Medicaid – the program serving the poor – continuing to steadily improve. In the three years since her son Diego was given a diagnosis of autism at age 2, Carmen Aguilar has made countless contributions to research on this perplexing disorder. She has donated all manner of biological samples and agreed to keep journals of everything she’s eaten, inhaled or rubbed on her skin. Researchers attended the birth of her second son, Emilio, looking on as she pushed, leaving with Tupperware containers full of tissue samples, the placenta and the baby’s first stool. Now the family is in yet another study, part of an effort by a network of scientists across North America to look for signs of autism as early as 6 months. (Now, the condition cannot be diagnosed reliably before age 2.) And here at the MIND Institute at the University of California Davis Medical Center, researchers are watching babies like Emilio in a pioneering effort to determine whether they can benefit from specific treatments. So when Emilio did show signs of autism risk at his 6-month evaluation — not making eye contact, not smiling at people, not babbling, showing unusual interest in objects — his parents eagerly accepted an offer to enroll him in a treatment program called Infant Start. The treatment is based on a daily therapy, the Early Start Denver Model, that is based on games and pretend play. It has been shown in randomized trials to significantly improve I.Q., language and social skills in toddlers with autism, and researchers say it has even greater potential if it can be started earlier. Too many tight connections in frontal-lobe circuits and too few long-distance links between the frontal lobe and the rest of the brain may cause some of the language, social problems and repetitive behavior seen in autism spectrum disorders, according to a new study published in Science Translational Medicine. The research links a variant of the CNTNAP2 gene to this particular type of rewiring in the brain. "I think it is quite a beautiful study," says Kamila Markram, director of the Autism Project at the Brain Mind Institute of the École Polytechnique Fédérale de Lausanne in Switzerland, who was not associated with the current research. "What's new is that it brings the genetic data together with the functional brain activity and that is usually not done. Either people look at gene expression or they look at functional brain activity. To bring them together and relate them to say, 'That particular gene is responsible for the different connection pattern that one observes,' that's a unique research area and that's the beauty of the study." ... I want all autism families to know that the leaders of Department of Defense’s autism research program really get it. They are our allies in the fight for our children, rather than just another obstacle. The DOD strongly believes in stakeholder involvement. The DoD actually WANTS parents’ opinion regarding their research choices. They INVITE a diverse body of Moms and Dads in sit on their grant committee panels. The DoD ENCOURAGES parents to fully participate in all scientific, clinical and treatment discussions. DoD EMPOWERS each stakeholder as a fully voting members of grant committees. The DoD ASKS families what they think of their previous research work and how they can better respond to the needs of people living with autism NOW. My 19-year-old son is diagnosed with asperger's syndrome, an autism spectrum disorder. Imagine the outrage I felt when I opened my mailbox to discover a political attack ad against my husband (Dennis Richter, candidate for Washington State Representative in Legislative District 1, Position 1), which was addressed to this same son, stating that, "If you're concerned about the risk of autism ... Then you should be concerned about the risk of politician Dennis Richter." It is despicable that any false claim be made against my husband, but this one is particularly offensive! Dennis cares deeply about children affected by autism, one of them being his own stepson! • "Our political opposition is trying to deceive voters by misstating our positions on important issues. For example, one recent mailer said I am against screening for autism and breast cancer. This is a blatant lie, twisting what I believe about health care mandates. Put simply, I do not believe it is the function of state government to tell private industry what they have to sell to consumers. Any insurance company should be allowed to sell policies that provide a wide range of coverage. That will keep our health care costs as low as possible. We believe that voters will see through this type of strategy by our opposition and will side with the common sense solutions our campaign offers." As of this morning, Richter was running behind his opponent. A coalition of disability advocacy groups is beginning to splinter after a revised restraint and seclusion bill introduced in the Senate last month opened the door for the practices to be included in students’ individualized education plans, or IEPs. The National Disability Rights Network — an umbrella group for the protection and advocacy organizations in each state — is now publicly supporting the new Senate bill, which allows restraint and seclusion to be included in IEPs under certain circumstances. Curt Decker, the group’s executive director, calls it a “political compromise” that is necessary in order to protect students, many of whom live in states with no regulations over the use of restraint and seclusion. SEE ALSO MOST RECENT POST ON SECLUSION & RESTRAINT. Believe it or not, for all the vociferousness with which I routinely go after anti-vaccine loons, I'm actually a relative newcomer to the task of taking on the anti-vaccine movement. Ten years ago, I was blissfully unaware that such a movement even existed; indeed, I doubt the concept would even have entered my brain that anyone would seriously question the safety and efficacy of vaccines, which are one of the safest and most efficacious preventative medical interventions humans have ever devised, arguably having saved more lives than any other medical intervention ever conceived. Even six years ago, although I had become aware of the existence of the anti-vaccine movement by that time, when I considered anti-vaccine loons at all, I considered them a small bunch of cranks so far into the woo that they weren't really worth bothering with. Yes, I was a shruggie. All of that changed not long after I started the first iteration of this blog back in December 2004. Approximately six months later, to be precise, is when everything changed. That was when someone as famous as Robert F. Kennedy, Jr. published an infamous screed simultaneously in Rolling Stone and Salon.com entitled Deadly Immunity that was so full of misinformation, pseudoscience, and conspiracy mongering that it altered the course of my blogging forever, beginning when I called it the "biggest, steamingest, drippiest turd" I had ever seen. Although I had already been becoming less and less of a "shruggie" about the anti-vaccine movement before RFK's propaganda piece, "Deadly Immunity" resulted in a significant percentage of my blogging turning to discussions of the anti-vaccine movement and the scientifically-discredited myth that vaccines cause autism.